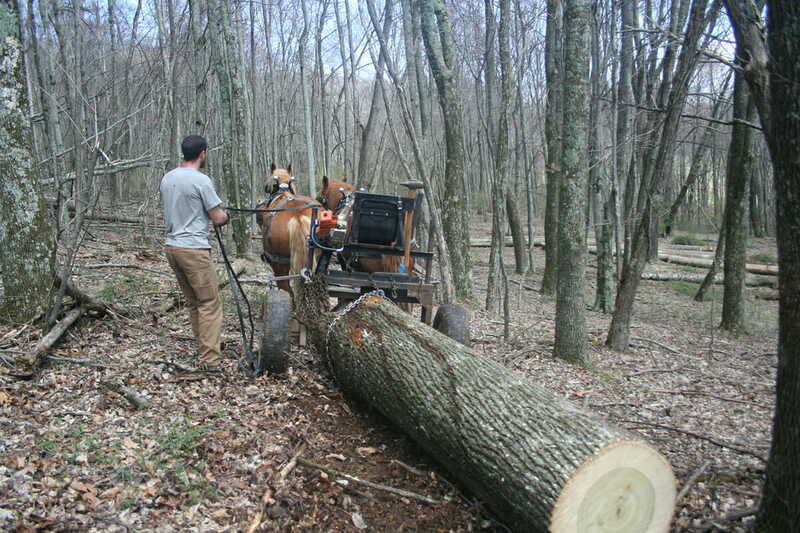 Ben Harris has been using horse teams to log Virginia forests since he was 18, and is part of a small group of loggers bringing renewed relevance to this old tradition. The dynamics of the 21st century global marketplace can be found everywhere, even a remote mountainside in the far reaches of western Virginia, where Ben Harris and his crew are harvesting large tulip poplar logs in 10- and 12-foot pieces. Strong export demand means timber prices are good these days; after sawing and kilning elsewhere in Virginia, this wood will very likely end up in China, its eventual use unknown. But while the Virginia hardwood’s fate is futuristic, its method of processing predates Chinese export demand by many centuries: draft horses. 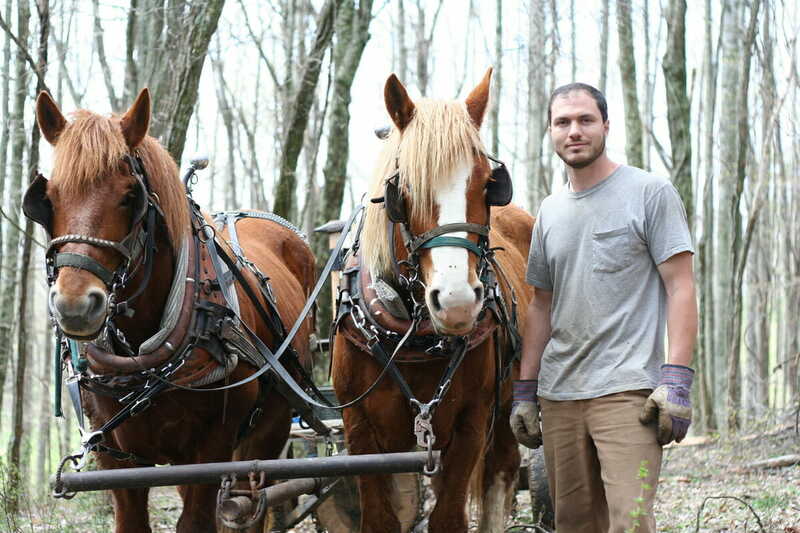 Harris, 29, has been using horse teams to log Virginia forests since he was 18, and is part of a small group of loggers bringing renewed relevance to this old tradition. While the horse logging industry consists of just a few dedicated fulltimers right now, the demand is such that the industry would welcome more. 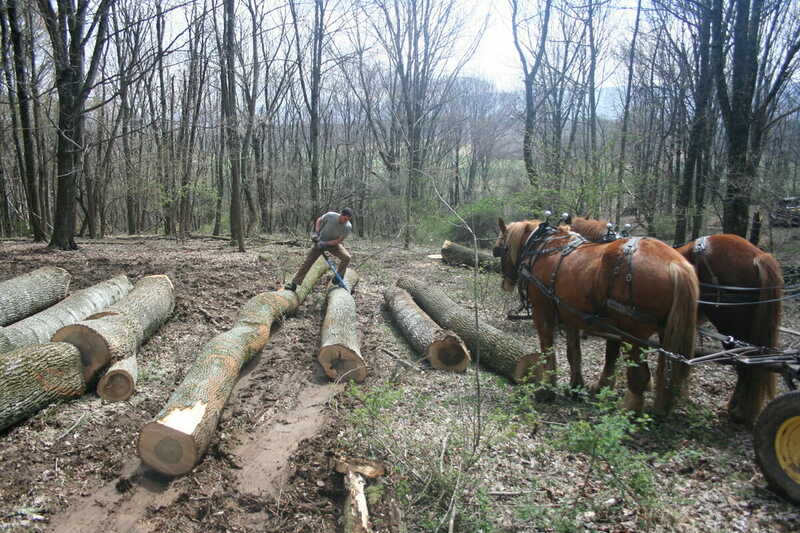 Harris and colleagues use modern saws to cut down the wood and the horses’ main role is dragging felled logs from stump to the truck-loading site. As the owner Sinking Creek Horse Logging, Harris’s work schedule is booked solid for six to eight months, minimum. In part, that reflects forest owners’ growing desire to minimize the environmental and aesthetic impacts of conventional, diesel-powered logging. Harris rolls over a log to clear space for the next one, while his horses look on. “The horses don’t do as much damage as a skidder would do in the woods,” said Lou Woodall, the owner of the Craig County woodlot where Harris is working with his team of Suffolk Punches on this warm spring morning. Economics also figures into growing demand for horse loggers like Harris. Privately-owned forest land in Virginia is becoming increasingly fragmented, causing the percentage of small tracts – 20 acres or less – to creep up over the past decade, according to the USDA. Hauling a bunch of modern logging machines to a job site is more expensive than pulling a horse trailer, and that higher overhead for conventional logging can make horse logging cost-competitive on small woodlots, even though it’s more labor intensive. The high price of fuel further bolsters the economic appeal of horse logging for forest landowners. Harris is just about to command his horses to ‘go,’ a large log chained to the logging cart. In any case, Harris said he’s making a solid living with the help of his Suffolk Punches. “My favorite part would definitely be working with the horses,” said Harris, who grew up around horses and trains and works with his by communicating with them in their own subtle horse language (he is a fan of Monty Roberts,an original, real-life horse whisperer). He shares a special human-draft animal bond with them, based on a sense of fulfilled purpose. These horses were bred to work. On Monday mornings after an idle weekend in the pasture, they’re steppy, eager to put in some time, to spend a day pulling logs out of the woods. Horse logging is no anachronism; it is simply old, and like many other traditional farm technologies, increasingly back in style. A previous version of this story stated that Ben Harris is a fan of horse whisperer Buck Brannaman, not Monty Roberts.